If you only visit one national park in the United States, Yellowstone National Park is the one. Yellowstone National Park has so many scenes and features among the best in the world packed into one park, it’s incredible. Yellowstone National Park has a version of the main feature from other national parks plus the unique thermal feature all its own. Do you want a canyon? There is the Grand Canyon of Yellowstone, arguably prettier than Grand Canyon or Black Canyon. Do you want a lake? There is Lake Yellowstone that rivals Crater Lake and Voyageurs. Do you want mountain scenery with tall lodgepole pines? There is the northern section of Yellowstone with its high peaks, some over 10,000 feet that’s comparable with Rocky Mountain. Do you want plains with wildlife? There is Lamar Valley, where Bison, wolves, and bears roam that is better than Theodore Roosevelt. Do you want waterfalls? Lower Yellowstone Falls and Tower Falls rival Yosemite Falls. Yellowstone National Park is the granddaddy of all national parks. It was the first national park, established in 1872, well before the National Park Service was established in 1916 and well before Sequoia and Yosemite, the second and third oldest national parks, which were created in 1890. Yellowstone National Park remains one of the most popular and most famous around the world, with hordes of international visitors. Yellowstone was the 51st national park we visited in our journey to all 60 national parks in 2016 and the third time I’ve been to Yellowstone. After visiting all those national parks, I am even more convinced Yellowstone National Park is my favorite. 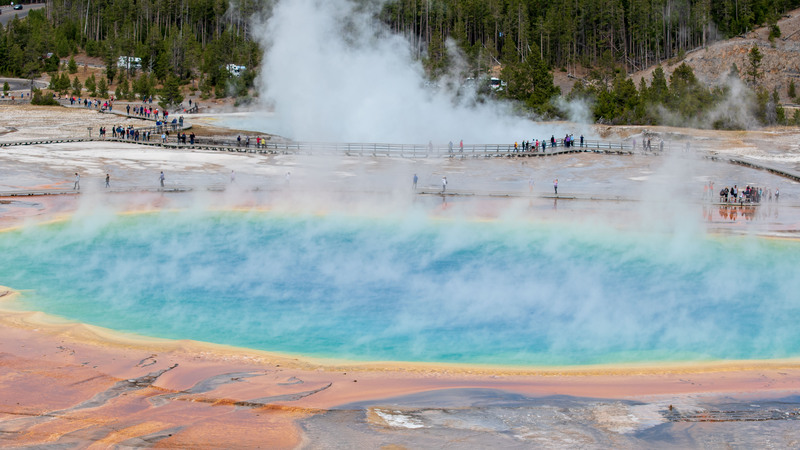 Unique to Yellowstone National Park is the variety and quantity of geothermal features. Yellowstone National Park sits on a giant caldera, with the heat of the earth close to the surface. 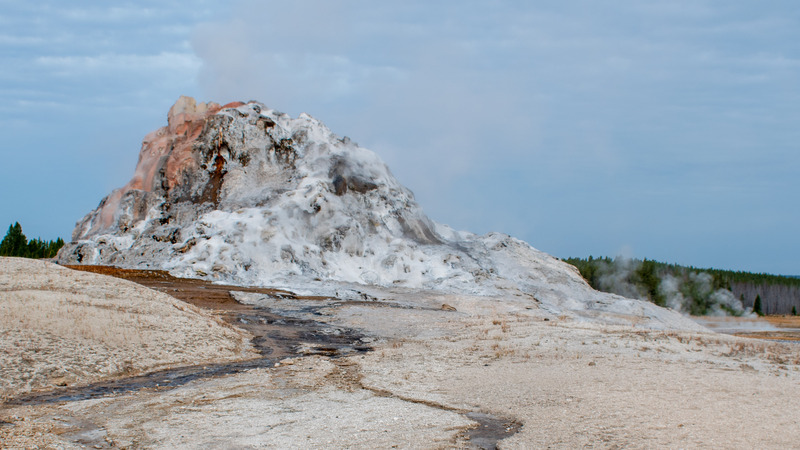 There are steam vents, geysers, pristine blue and green pools, and boiling mud pots. The bacteria that adapted to the harsh, hot conditions adds bright yellow, green, red, and white colors to the landscape. Geysers are a top attraction at Yellowstone National Park because of its sheer display of power. It’s amazing that natural phenomena like the Old Faithful geyser can be predicted so accurately. 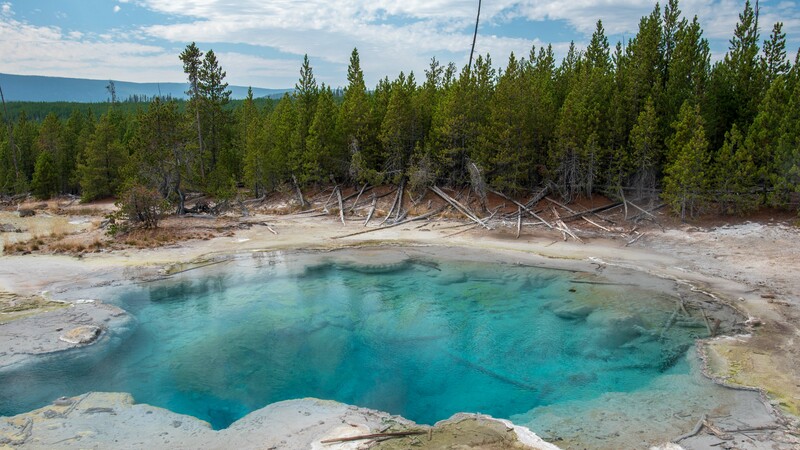 There is a subculture of people, called Geyser Gazers, who obsess over the geysers, some willing to wait for hours and days for a geyser like Steamboat Geyser to erupt. 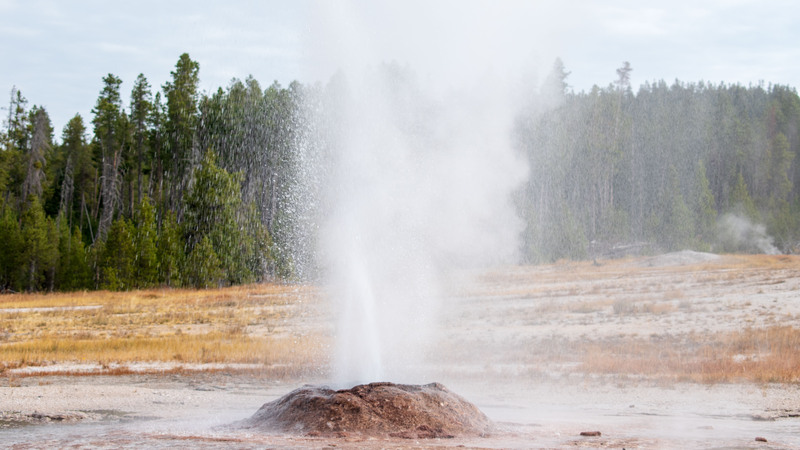 While Old Faithful was built for crowds, geysers such as the Lone Star Geyser, a couple of miles of hiking on a flat trail from the road, gives an up close and intimate experience without the crowds. 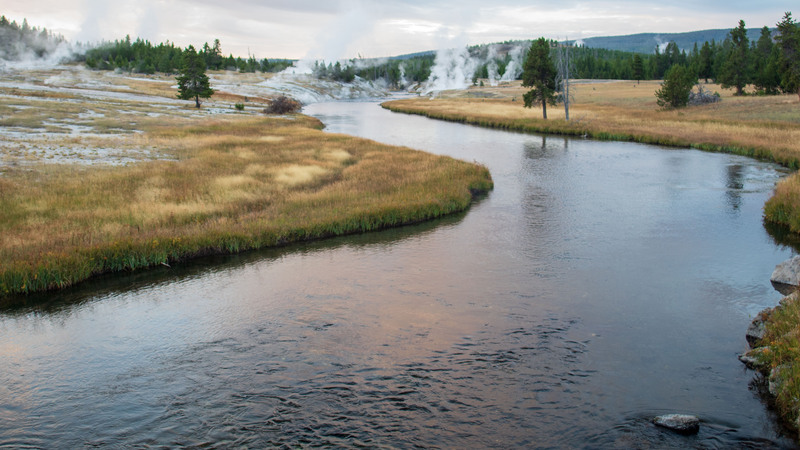 The sheer volume and variety of these geothermal features alone would make Yellowstone a top national park. 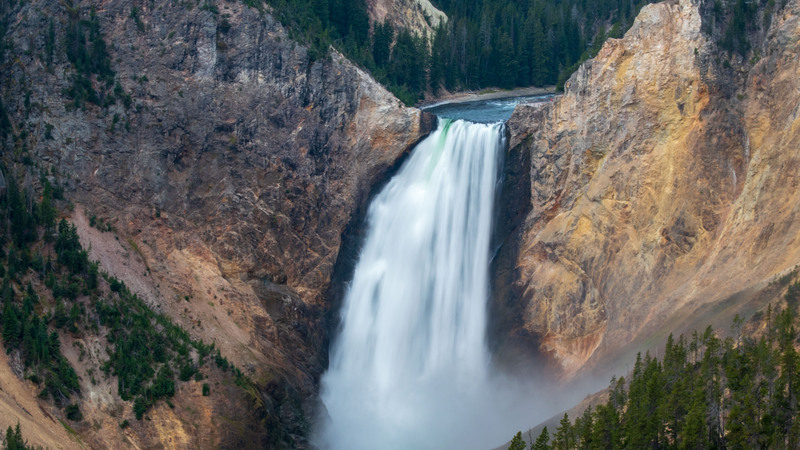 Combined with all the other features, Yellowstone National Park is unrivaled! 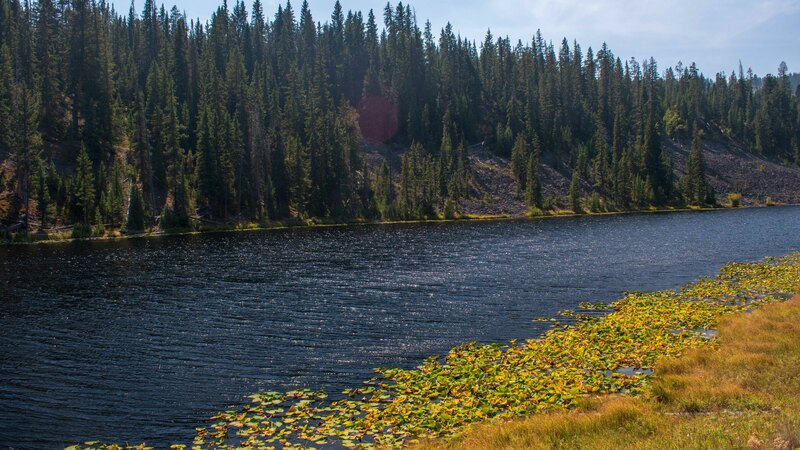 Yellowstone National Park is one of the most accessible national parks, once you get here. The Grand Loop takes you to all of the top sights, with short walks from the parking lot to the best features. Auto touring is easy with many short paths that are wheelchair accessible. Most trails to the top features are less than a mile, are often paved or have boardwalks. The ease of access is ideal for auto touring and buses. Oh, the buses! On the one hand, I want as many people to enjoy the stunning natural scenery as possible, but when a busload of 50 people disgorge from a bus nosily idling in the parking lot, with the tour guide holding a flag and a megaphone, and people jostling for the perfect spot to take a posed photo, it ruins the tranquility and the nature part of the natural scenery. Often, several buses converge at one scenic point and the place feels like Frontier Land at Disney World! 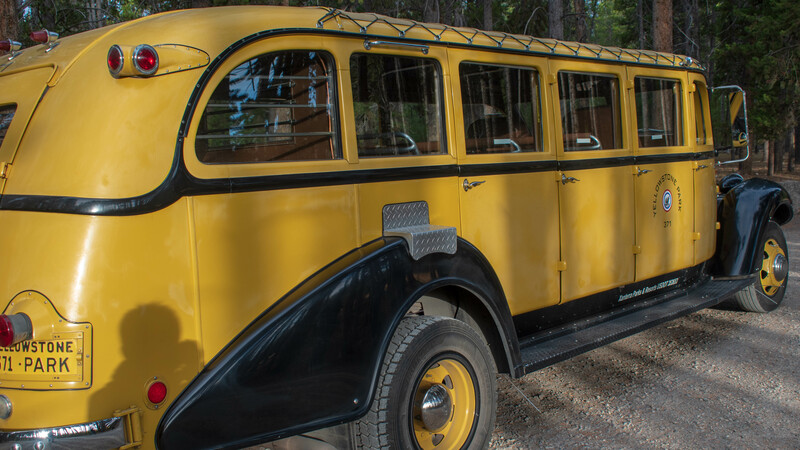 Yellowstone National Park attracts her share of “theme park” people who hop from one main attraction to another, take the requisite pictures, and spend 15 minutes at each place for “drive-by sightseeing”. If you don’t want to deal with the theme park crowd, avoid the top attractions between 10 am and 4 pm. Visit these places before 10 or after 4, when the crowd thins out. 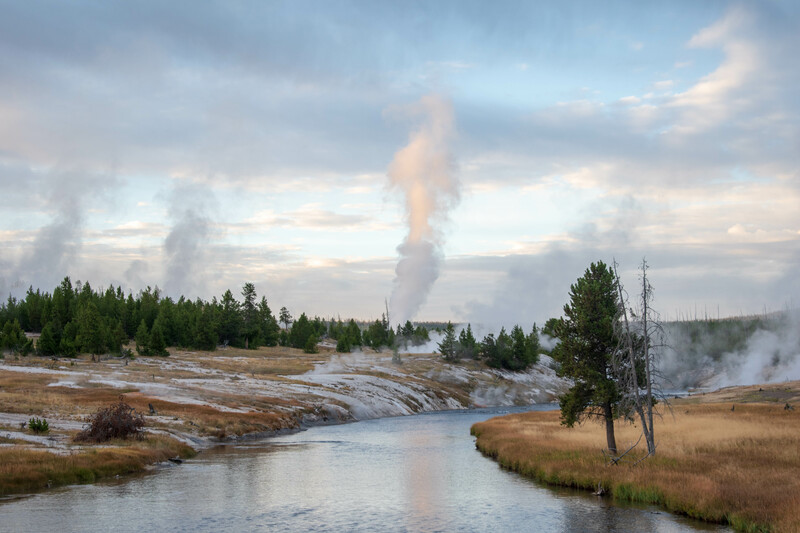 Early morning and late afternoon are magical times at Yellowstone. The wildlife is much more active and the people sparse. The softer light creates much more beautiful scenes that are not only pleasing to the eye but also great for photos. 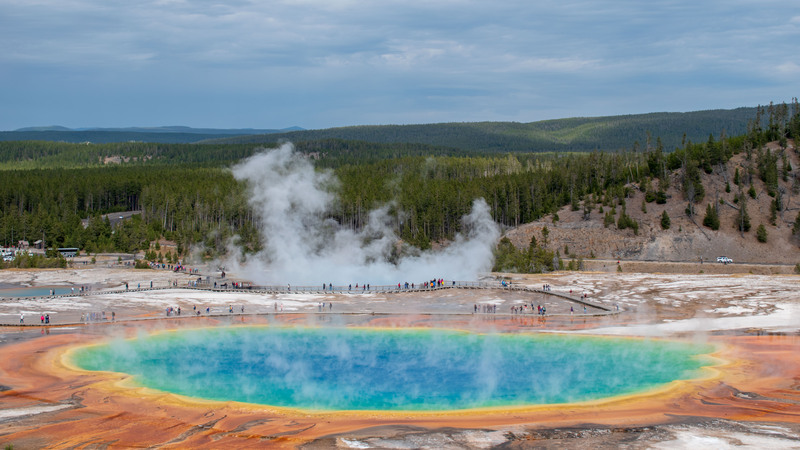 These are the times to visit the top attractions such as the Grand Canyon of Yellowstone, Norris Geyser Basin, Prismatic Springs, and Lamar Valley. Old Faithful can be visited at any time because it was built for large crowds. During the day, go hiking! 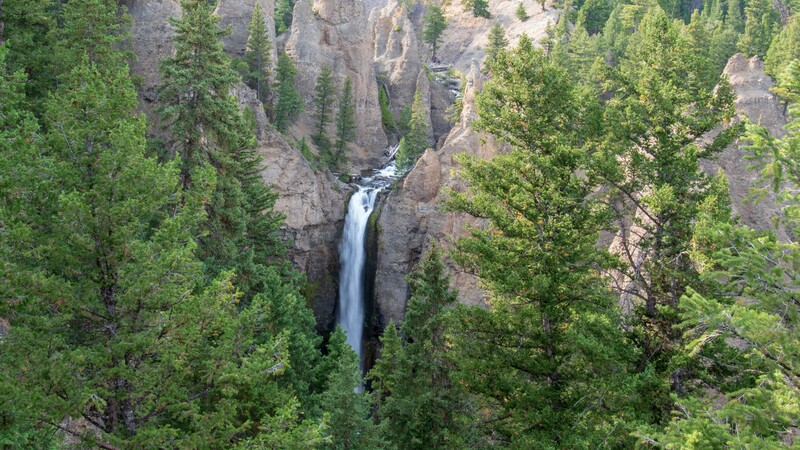 My best experiences of Yellowstone National Park are the hikes we took. There are so many hikes to choose from, there is a trail for every ability. The trails get you away from the crowds and often gives you gorgeous views and animal encounters. On these trails, the “theme park people” disappears and the “national park people” are my friendly fellow hikers. This is where Yellowstone National Park really shines. 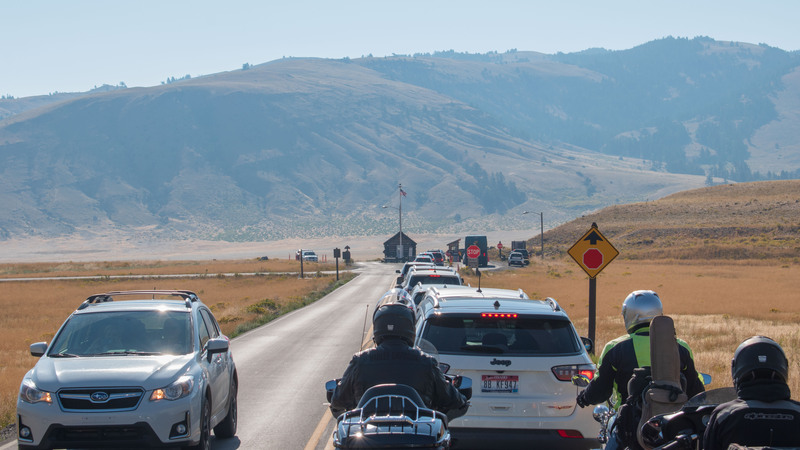 We entered Yellowstone National Park from the north and into Mammoth Hot Springs from the gateway town of Gardner, Montana and chose mid-September to avoid the crowds but even on this September day, there was a line at the park entrance at mid-morning. We stopped at the visitor center and did our national park business (stamp, talk to the ranger) and proceeded to Tower along the northern portion of the Grand Loop. The road followed Yellowstone River, high on the south side as the scenery got increasingly grand with elevation. The road twisted alternately through pine forests and open vistas where the river was visible. Tower-Roosevelt is the base for horseback riding and has a lodge and restaurant. It’s the last to open and the first to close for the season. We hiked the Lost Lake hike that climbed steeply through a forest to a high plain before we found a pristine lake with a meadow on two sides and sandwiched between steep hills full of pines and firs. Lily pads floated on the edge of the lake and the water was clear and pristine. We nearly had the lake to ourselves as we explored the shore and found large chunks of animal bones. The scenery was gorgeous on this sunny afternoon. 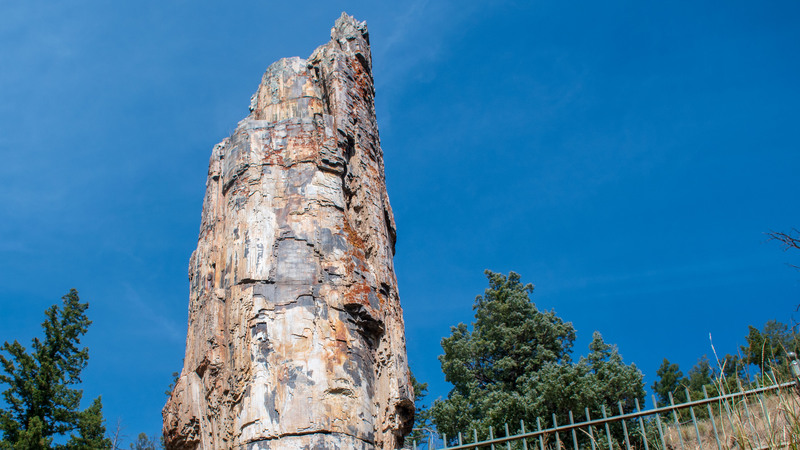 After the lake, the trail led to a piece of standing petrified wood before going up a hill to a high meadow. Soon, the grand vista of Yellowstone River with colorful hillside and the valley below came into view. The view from the high meadow was grand. This was an excellent 3.7-mile loop hike. Tower Falls was just down the road on the Grand Loop from Roosevelt Lodge. This was a “theme park crowd” stop. There was a short walkway to a viewpoint to see Tower Falls in the distance. The waterfall was beautiful and rivaled Yosemite Falls but because of the distance, the thundering sound was muted. The road between Tower and Tower Fall had plenty of pullouts to view the steep valley below carved by the Yellowstone River. The hills were colorful, with red, brown, white and yellow colors all reflecting the afternoon sun. These were great photo spots. We timed our itinerary so we would be in Lamar Valley near dusk because Lamar Valley is famous for wildlife and dawn/dusk are the most active times for animals. 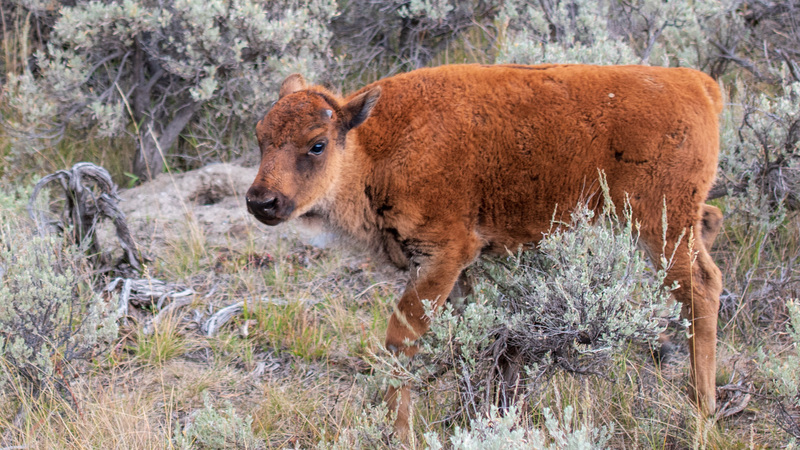 Sure enough, we saw many herds of bison, near and far. One herd of about 25, about 1/3 of them young calves, blocked traffic as they crossed the road at leisure. 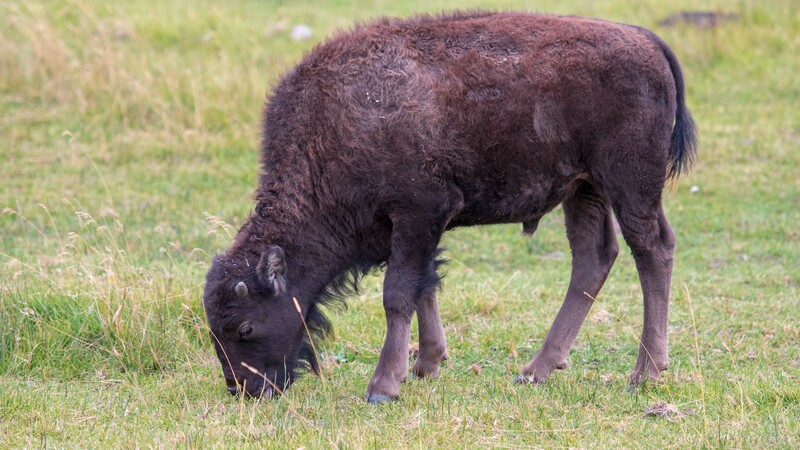 This happens often so if you are ever late for an appointment at Yellowstone National Park, use “bison jam” as an excuse! The best way to look for wildlife is to look for stopped cars and people with cameras or binoculars. 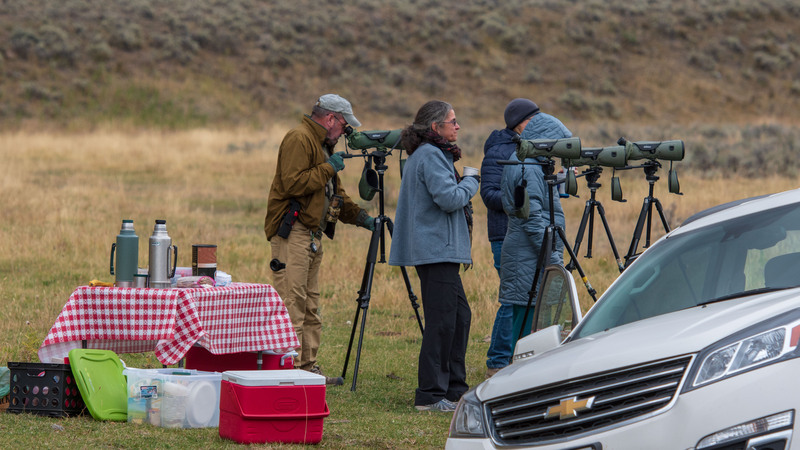 There was a sizable crowd gathered roadside with scopes, binoculars, and long lenses. In the meadow, next to a stream, was a carcass of a large animal and a grizzly feeding on it. Ravens circled, waiting for the bear to leave. There were 5 wolves nearby, watching and waiting for the bear to leave to get their fill. Wildlife chasers are a patient bunch. In this case, they set up shop on a hill by the road, with camping chairs, drinks, and snacks all ready. Some were there in the morning and just came back for the evening “shift”. They sit there and simply wait for bears, bison, wolves, and deer to come by. Some have been tracking a particular family of bears for days. They have high powered scopes and are thrilled every time the grizzly that was feeding on the carcass looked up. It felt like a tailgate party at a football game, minus the beer. Hard to be steady and track wildlife through high powered scopes when tipsy! Wildlife sighting rewards the patient, the observant, and the sober. As dusk settled in, we headed to Silver Gate, just outside of the northwest entrance, for dinner. The assumption was the food at a gateway town would be better than in the park, based on the variety of choices at Gardner, MT. The road soon left the broad Lamar Valley and into the tall mountains of the northwest Yellowstone National Park along Soda Butte Creek. Just outside of the park boundary was the small town of Silver Gate. We went to the only restaurant we saw, the Log Cabin Café, that advertised Lake Trout. It was about 3/4 full but really, really quiet. Everyone seemed to be speaking in hushed voices. The server saw us, didn’t do or say anything, even after we picked a table and sat down. He did not greet us or even attempted to get us a menu. The whole place felt creepy and weird, like a scene from Twin Peaks. After a couple of minutes, Loretta and I looked at each other and without saying a word, got up and left. We proceed to Cook City, which looked like a bigger town on the map, about 4 miles up the road. Sure enough, it was bigger and we spotted at least 4 restaurants. The sign for the Prospector looked nice so we peeked inside the window but saw it was open but empty. We looked across the street and saw a lot of people at a restaurant and decided to follow the crowd. The menu looked average and there was a 30-40 minute wait. It was about 7:00 and we decided to go back to the Prospector and try that one. We were looking at the menu as the restaurant was being vacuumed and a lady came out and told us where to go to get burgers, pasta, or Asian food. Very strange because it felt like she didn’t want our business. We went down the street to the Bistro. There were two other tables having dinner so we stayed and got a burger. After all, how badly can a restaurant mess up a burger? The waitress did not greet us as we picked up a menu to see the selections. We picked a table, sat down, and finally, she came over and asked for our order. She waited until just before our food arrived to gives us napkins, forks, and knives. The burger was just OK but at this point, we were weirded out by the town and just wanted something in our stomach before driving to Canyon Village for the night. Strange, very strange! Our first three nights were at Canyon Village, which is a relatively new addition to Yellowstone National Park. The drive in total darkness on winding roads from Cook City was long and I’d recommend against driving in the dark at Yellowstone National Park. Canyon Village is Disney like and designed to handle lots of people. There is a visitor center, a general store, a large-scale cafeteria, a burger joint, a tackle shop, and of course, gift shops. Canyon Lodge has a series of lodge buildings and cabins, all designed and built to blend with the natural theme. It is centrally located and beautiful but expensive.